On average, this will save one hour per employee, per week. This equates to £ 42,25 per month. No more manual logging of activity reports, less administrative expenses. Errors in data collection are now a thing of the past, as are work reports that are missing or have been filled out wrongly. Actual working hours are logged automatically complete in a tamper-proof manner. The staff that were previously involved with data collection can now be put to use on other tasks. On average, this will save one full-time position per 70-100 employees. This equates to approximately £ 28.37 per employee per month. Without the necessary technical support, it is often the case that additional activities carried out by employees are not reported to the headquarters, since this takes too much effort and they are not usually noticed by the manager. According to estimates, these non-calculated services add up to at least 15 minutes per week, which amounts to £ 10.47 per month, the typical full-cost rate of a basic cleaner for the industry. At any given moment, the avantclean software knows your calculation for every room on each day, as well as the actual costs for performing a service on any particular workday. This makes it possible to recognise the loss-makers in the blink of an eye and eliminate any further losses promptly. The industry-typical value is 0.5% of the services, so roughly £ 10 per employee per month. Days off regularly occur as a result of dissatisfaction, internal conflicts, lack of loyalty to the company, and so on. The unambiguous specification of the services to be rendered and shift times helps to avoid errors, misunderstandings and trouble. We recommend SIM card tariffs that offer flat rates for calls and text messages. This will enable employees to use the telephones for personal needs without incurring added costs. Simply the fact that every cleaner receives a smartphone increases the value of this employee and increases their loyalty to the company. If the employees are also allowed to use the telephone as much as they want in private, this will boost their loyalty to the firm even more. At the same time, employees who previously worked according to their own rules may be opposed to the introduction of this technology. This will provide you with a clear insight into which employees you should pay particular attention to in future. If you reduce the number of days off per full-time employee by just one per year, this would save you around £ 75 per year, exactly £ 6.50 per month. It has been reported time and time again that clients are attempting to reduce the overall costs of building cleaning by making complaints about defects. The avantclean software is the first solution that gives you real-time access to all of the performance data for each individual employee. This means that you have all necessary information available in the event of a complaint and will be able to avoid unjustified invoice reductions. What’s more, your clients can also access this information at no added cost. You can achieve a level of transparency that was previously unheard of and, in doing so, increase the trust that your clients have in your employees’ work. As a result, fewer clients will terminate their contracts and distribution costs for customer acquisition decreases, while the relationship between the client and your on-site employees improves. 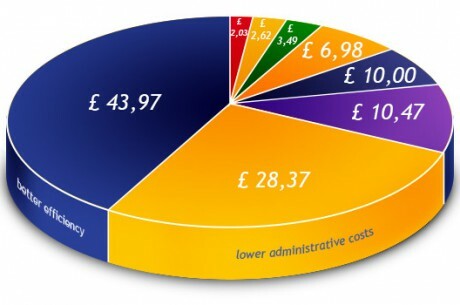 The industry-typical value is 0.25% of the services, so roughly £ 2.44 per employee per month. In companies with more than 100 employees, each employee takes an average of 10 days off. This means that around 1000 tasks have to be re-scheduled and distributed among the employees. If the cleaning tasks are constantly being re-allocated, this means a number of additional arrangements have to be made. At a time expenditure of 15 minutes per scheduling alteration and 10 alterations per employee, this means that £ 2.03 is saved per employee, per month. The mobile software provides information about the tasks that need to be performed, the order in which they are carried out and any special details that need to be noted, all in an unambiguous manner. If each employee were to miss eight hours of training, this adds up to a potential time saving of £ 1.56 per month, per employee for each team leader. A cleaning company would have to make per year per cleaner £ 23,011.73 more revenue in order to achieve the same earnings as the introduction of Avantclean Solution. Avantclean, then you could increase your yield before taxation to £ 920.47 per cleaner. thus almost doubling your profits. The potential savings are important for your business, the relationship with your clients leading to effective cost reductions. Their significance varies from one company to the next and this cannot be quantified in monetary value alone. Correct billing, transparent service provision, consistently high quality and reliability are the most important factors to ensure long-term customer loyalty. 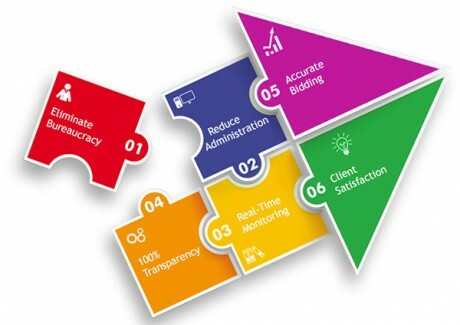 The Avantclean solution has a positive effect with all these features allowing you to improve your business confidence with clients. Better client relations is everyone’s priority in order to avoid the costs and expense of finding new business. Avantclean automatically records all of the tasks being performed in real-time. Deviations are recognised and reported automatically drastically reducing the time managers and supervisors need to monitor employees. More quality time is available to enhance your services and leaving you operation better prepared for any incidents..
All companies have to manage days when employees are sick and absent from work. The bigger the company the bigger the issue. Avantclean enables detailed scheduling across the entire operation. Resolving the replacement of employees is just a touch away from your device. Deployment of staff is smoother since their shift tasks are visible immediately on their smartphone wherever staff replacements are necessary. Utilising a transparent administration and operations workflow across your business is another benefit of Avantclean. Everyone is on top of matters across all staff and operations providing information immediately, eliminating tedious searches and updates are visible in real-time. The transparent exchange of work flow makes everyone accountable and reduces unnecessary workloads in the office and on site. 05 Clearly calculated work flow enable more accurate and competitve bidding. Competitive work bids are more manageable. The Avantclean software provides you with the security that you can also keep the commercial risk of a particular job to a minimum, even in the case of tightly calculated margins. Why? Real-time monitoring and transparent work flow make your entire team more accountable. The result? A business that looks better offers impeccable service in the public eye creates more sales opportunities and more opportunities to find good employees.